Draft: 2002, San Francisco Giants, 4th rd. October 15, 2015 RHP Kevin Correia elected free agency. August 7, 2015 Lehigh Valley IronPigs placed RHP Kevin Correia on the restricted list. July 8, 2015 Philadelphia Phillies sent RHP Kevin Correia outright to Lehigh Valley IronPigs. 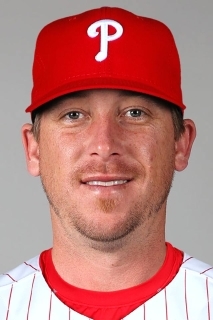 July 7, 2015 Philadelphia Phillies designated RHP Kevin Correia for assignment. June 8, 2015 Philadelphia Phillies signed free agent RHP Kevin Correia. May 30, 2015 RHP Kevin Correia elected free agency. May 1, 2015 Sacramento River Cats activated RHP Kevin Correia. April 8, 2015 RHP Kevin Correia assigned to Sacramento River Cats. April 5, 2015 San Francisco Giants signed free agent RHP Kevin Correia to a minor league contract. March 30, 2015 Seattle Mariners released RHP Kevin Correia. March 17, 2015 RHP Kevin Correia assigned to Tacoma Rainiers. March 9, 2015 Seattle Mariners signed free agent RHP Kevin Correia to a minor league contract and invited him to spring training. October 30, 2014 RHP Kevin Correia elected free agency. October 13, 2014 Los Angeles Dodgers activated RHP Kevin Correia. October 3, 2014 Los Angeles Dodgers reassigned RHP Kevin Correia to the minor leagues. August 11, 2014 Los Angeles Dodgers activated RHP Kevin Correia. August 10, 2014 Minnesota Twins traded RHP Kevin Correia to Los Angeles Dodgers for Player To Be Named Later. December 13, 2012 Minnesota Twins signed free agent RHP Kevin Correia. November 3, 2012 RHP Kevin Correia elected free agency. November 1, 2011 Pittsburgh Pirates activated RHP Kevin Correia from the 60-day disabled list. September 6, 2011 Pittsburgh Pirates transferred RHP Kevin Correia from the 15-day disabled list to the 60-day disabled list. December 17, 2010 RHP Kevin Correia assigned to Pittsburgh Pirates. November 7, 2010 RHP Kevin Correia elected free agency. May 15, 2010 San Diego Padres activated RHP Kevin Correia from the bereavement list. May 11, 2010 San Diego Padres placed RHP Kevin Correia on the bereavement list.